The 2011 Apple Distinguished Educator (ADE) Institute was held in Phoenix, AZ. So, several of us ADEs decided to assemble for a brief Photo Safari into the desert realms around Phoenix to make some photos that are quite different from the landscapes we see in our home towns. 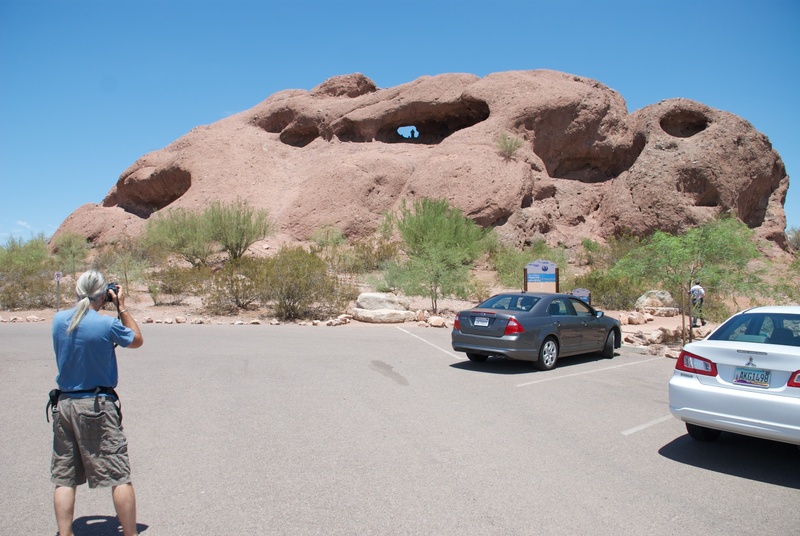 Shortly after our flights arrived and we got checked into our hotels, we piled into a couple of cars and struck out for Papago Park. 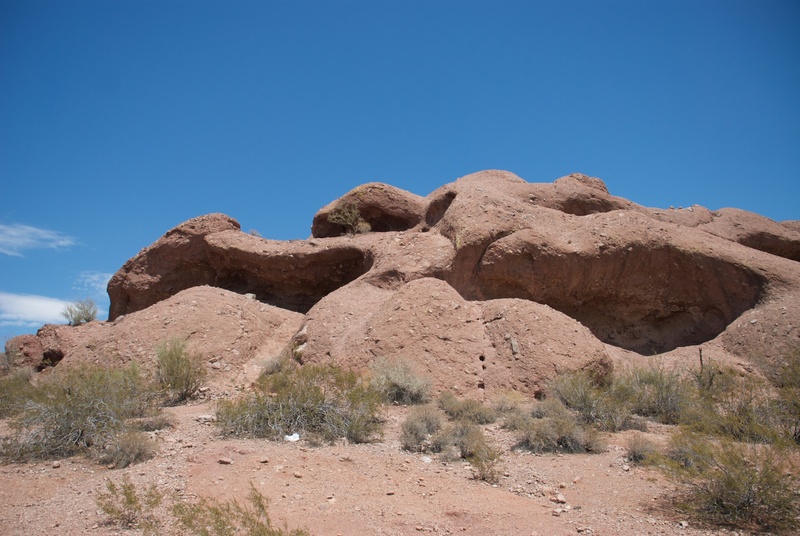 This place is a natural desert habitat and has a variety of terrains and natural elements that made for exciting photographs. 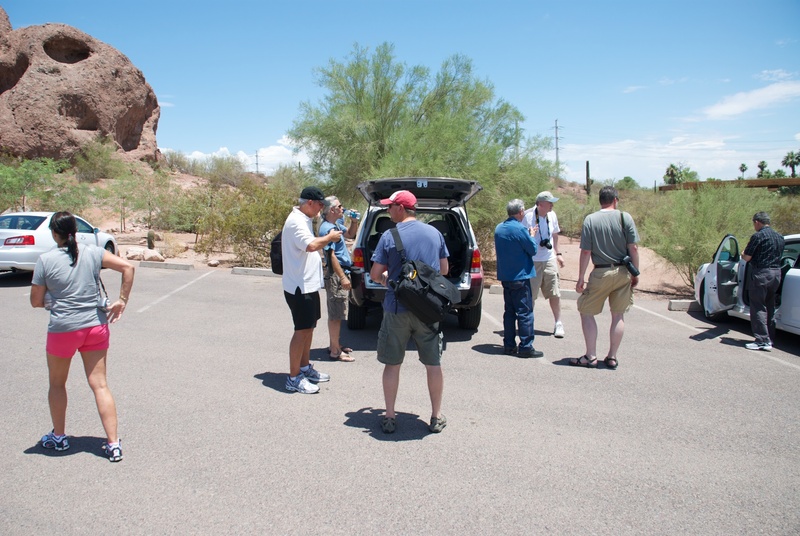 When we arrived at Papago Park, everybody got out of the car and began surveying the site before us and we all began discussing the types of shots we could capture during the afternoon. Of immediate interest was this intriguing rock formation that lay in front of us. Even before we ascended this object, we were pitching around ideas for places that would be good to position ourselves and portions of the hill that would provide intriguing photos. So, we began our steady climb. The intense heat (temperatures were reaching 118 degrees Fahrenheit!) 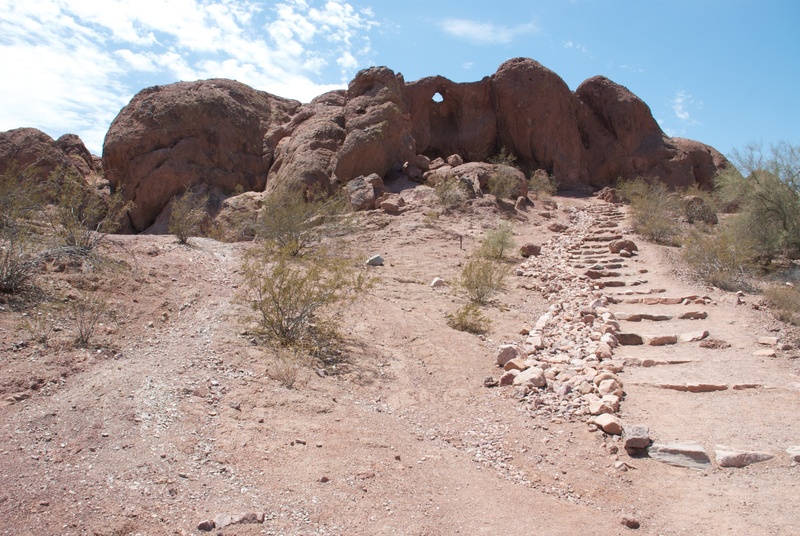 caused special challenges for several of us who were unfamiliar with both the terrain and the dry heat. Nonetheless, we accepted the challenge that nature lay before us…and climbing upward we went. Before too long, several of us reached the peak of this rock formation. We commented on how the barren nature of this particular formation defied the beauty of the land that lay close to its Western boundary. There, ahead of us, lay a type of oasis. In close proximity to the water, the vegetation seemed to be almost lush. At least, it was certainly more vibrant in comparison to this moonscape terrain near the protruding rock formation on which we stood. We had to almost harness our eyes and imaginations to keep from photographing everything. We were mesmerized by the cacti of various types, sizes, and colors. We were seeing plant life unlike anything we have in our home environs. After an hour or so of photographing this wonder of nature–and its intriguing surroundings, we took a break in some shade, replenished ourselves with fresh water, then set out for our next stop: Tempe Town Lake. In the city of Tempe, there is a waterway (man-made, we’re told) that runs through the city. 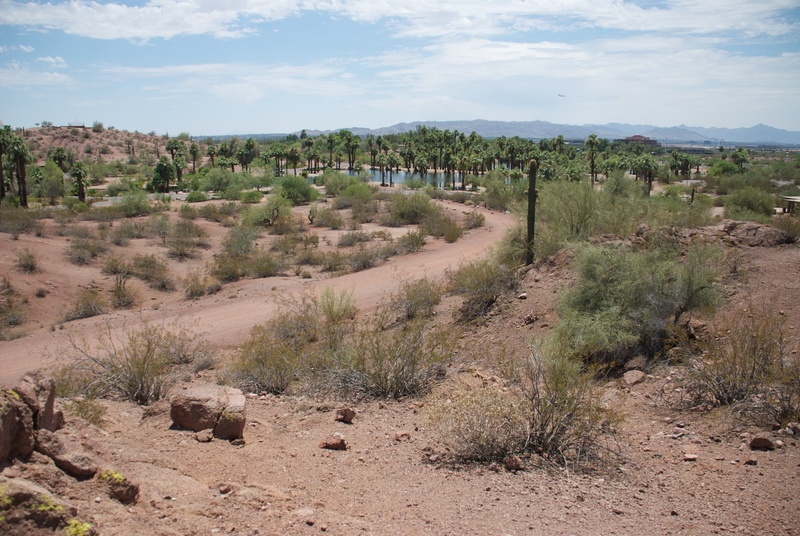 This place gives a refuge from the arid conditions of Tempe; thus, it is quite a popular place for people to visit. 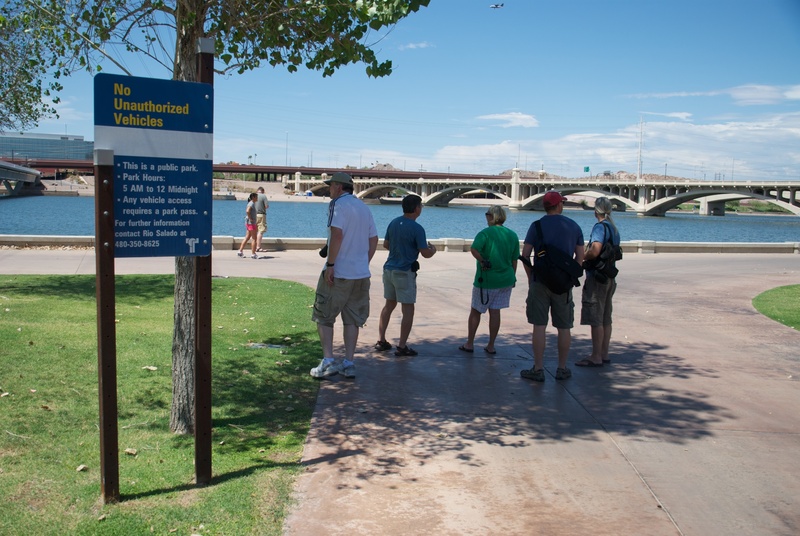 As we arrived, our Phoenix-area resident and guide (also an ADE), Dave Cornelious, gave us the history of Tempe Town Lake, then provided suggestions for elements to photograph. As you see, we huddled in the shade as he spoke to us! Following our visit to Tempe Town Lake, we returned to our cars and drove to the Phoenician Gardens, an area at Scottdale’s The Phoenician Resort. 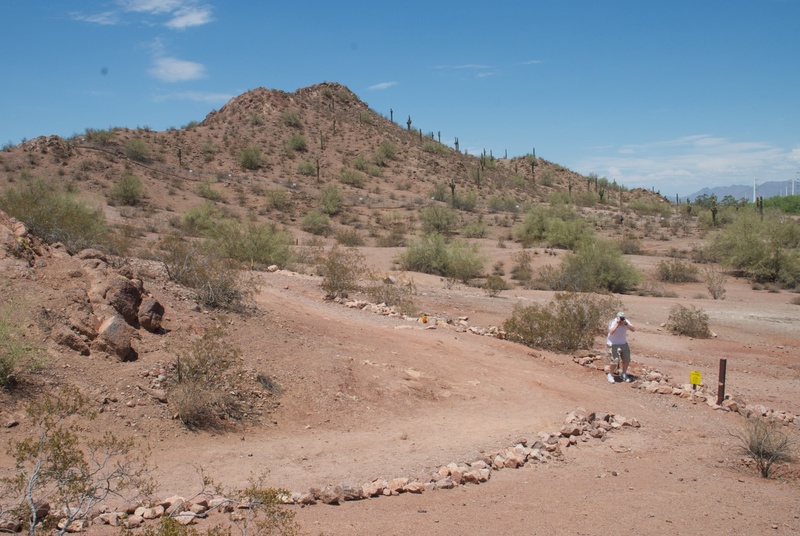 Here, we found a beautiful area mixed with desert terrain, complete with cactus plants of many varieties, as well as lush, green plats that seemed to have no lack of water for nourishment. We even saw ducks swimming happily in a man-made lake along the edge of a golf course. Quite a range of contrast in nature! I couldn’t help but be enamored with the gorgeous “blossoms” (I don’t know what else to call them) on several cactus plants. I did realize, though, that behind that beauty lay a big “ouch” if I got too friendly with the plants. 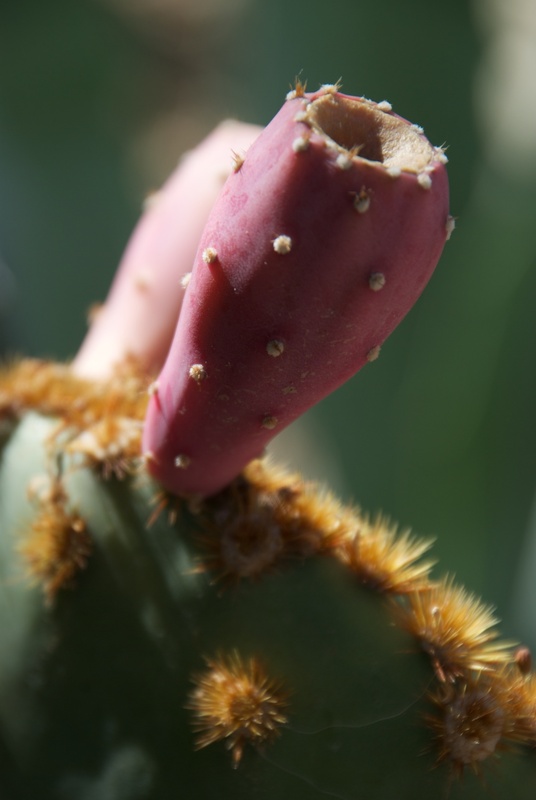 Too, I noticed that not all cactus plants remained in perfect form. 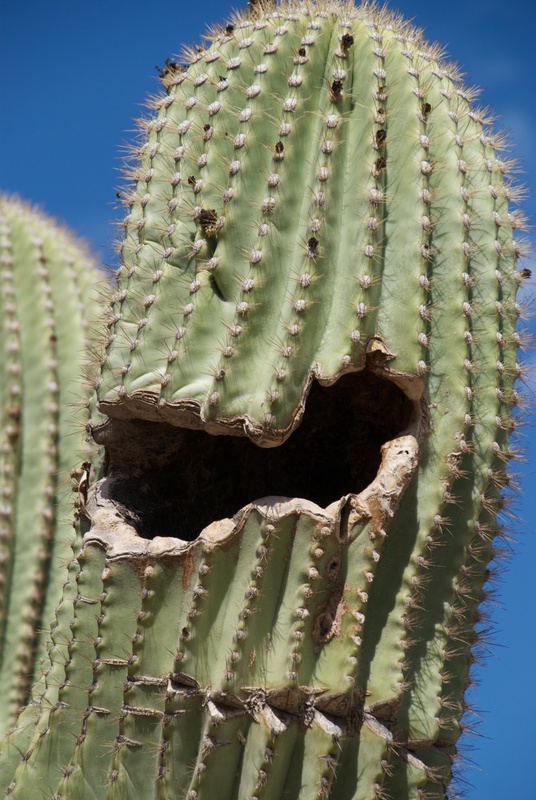 The big hole and other “botches” on this cactus seemed to give it a special personality. 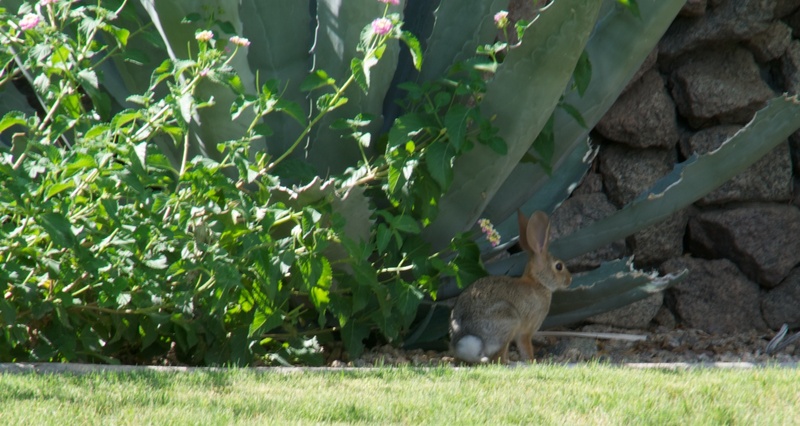 Yet, amidst all the typical desert flora and fauna, we found the casual animal visitors who seemed to feel right at home there. This little fella was quite friendly to us, almost serving as a kind of tour guide in one portion of the gardens. All in all, our Photo Safari was a huge success. Yes, we were hot–and required several bottles of water. But, we had some terrific photos to show for our experience. And, it seemed like the longer we were out in the bright, direct sunlight, the more acclimated we became to the temperature and brilliance of sun rays. All who went on this Photo Safari proclaimed that we’re ready to do it again!